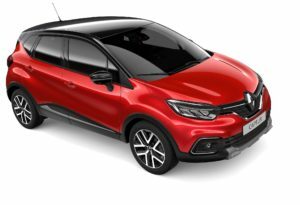 Renault is introducing a new style-focused version of its Captur small SUV that “blends the best of Renault’s style and technology”. Sitting above the Captur Play and Iconic, and below the Captur GT-Line, the S Edition model has new interior finishes and technology as well as a three-strong engine line-up. The new Captur S Edition will be available to order and test drive this month. A highlight of the new Captur S Edition is the Alcantara upholstery, which offers enhanced comfort. The Alcantara seats are trimmed with red stitching, while the steering wheel, handbrake and gear lever are finished in leather. The Captur S Edition includes a variety of standard equipment such as navigation, DAB radio, rear parking sensors, and automatic headlights and windscreen wipers. On the S Edition the lower door accents are coloured in Gun Metal Grey, as are the front and rear skidplates. The Captur S Edition has 17-inch ‘Filante’ alloy wheels that are exclusive to the model.